Business Systems and Consultants design unique, industry-tailored solutions for Aviation and Aerospace. 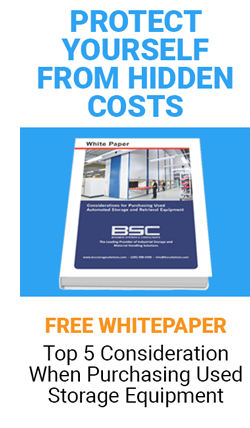 As with all manufacturing, production floor space is very expensive and becomes even more expensive when manufacturing or maintaining a product as large as an airplane or helicopter. Environments must safely store very delicate, expensive components and allow for maximum productivity and worker safety. The aerospace and aviation industry manage a huge volume of parts and inventory in manufacturing and maintenance. Managing these pieces and parts must be secure and efficient to provide rapid access and high-value protection. With our intelligent control systems, frequently accessed materials are stored close to the access point while items in lower demand are stored farther away. This allows for productivity increases and with the use of a BSC RFID or Barcode Systems, inventory processes and reordering are a snap. Additionally, the National Institute of Aviation Research is forecasting to increase the use of lightweight, high-tech composites in the future. Composite materials are in high demand for aircraft manufacturing. These materials have specific low-temperature storage requirements that must be controlled. The manufacture of aviation and aerospace components and products requires a considerable workspace, and with the average cost of rent increasing all the time, it’s crucial to make every inch of your production floor space matter. One of the easiest ways to work with what you have is with tailored storage solutions that can help you store materials more efficiently, organize components, and ease material handling. An essential product for this is the Hänel Lean-Lift, which is a high-tech storage system that can help you gain up to 60% more space by optimizing the use of your vertical height while increasing usable floor space. Solutions such as this, therefore, help you gain more storage space using the same area, but they also allow you to improve organization, efficiency, and worker safety. 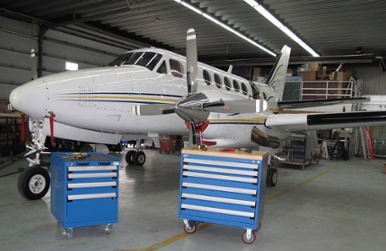 The components and materials used in aviation and aerospace manufacturing are both delicate and expensive, and many require specialized storage solutions to protect them from damage, and this includes things like dust and other elements as well as human error. Similarly, as the aviation and aerospace industry move increasingly toward high-tech composites, the need for controlled storage environments with low-temperature settings will increase, and the same storage solutions that can protect sensitive components can also safeguard high-tech ones. Solutions like the lean lift are also capable of providing secure storage for these delicate components, and safe environments where materials will be protected but also easily retrievable when needed. Disorganization in a manufacturing environment can spell disaster for workers because clutter and a lack of open space can lead to accidents in the workplace, increased downtime, and even damaged components. Beyond that, disorganization certainly decreases productivity because workers can’t be as efficient if the space is not arranged neatly and systematically. Imagine, for instance, the difference between trying to find a single document in a pile of unfiled papers versus being able to go to an alphabetized filing cabinet and immediately locate the record you need. Similarly, proper storage can result in a more organized workplace, and this will drastically improve efficiency and productivity. 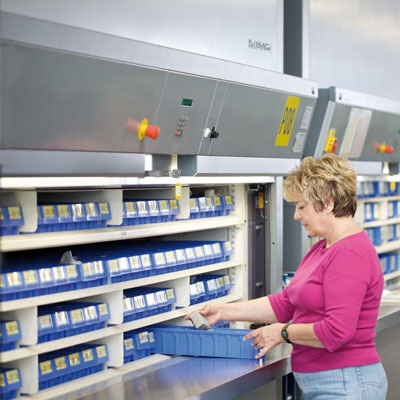 Moreover, some storage solutions can even feed components directly to workstations as they’re required, and this means workers have more time to focus on the tasks at hand. Finally, with an intelligent control system, you can arrange materials in such a way so the ones used most frequently are placed in highly accessible areas, whereas things that aren’t required regularly can be stored farther from primary workstations. Not only will this further increase efficiency, but also facilitate material handling and inventory management. You face unique challenges working in the aerospace and aviation industry, and Business Systems and Consultants has years of experience assisting organizations like yours to increase storage space, maximize efficiency and productivity, improve inventory tracking and management, and optimize workplace organization. For more information about tailored storage and material handling solutions for aerospace and aviation, contact Business Systems and Consultants today for a free assessment.